If you need your pickup truck to be a rugged workhorse, there are better – and far cheaper – options on offer. 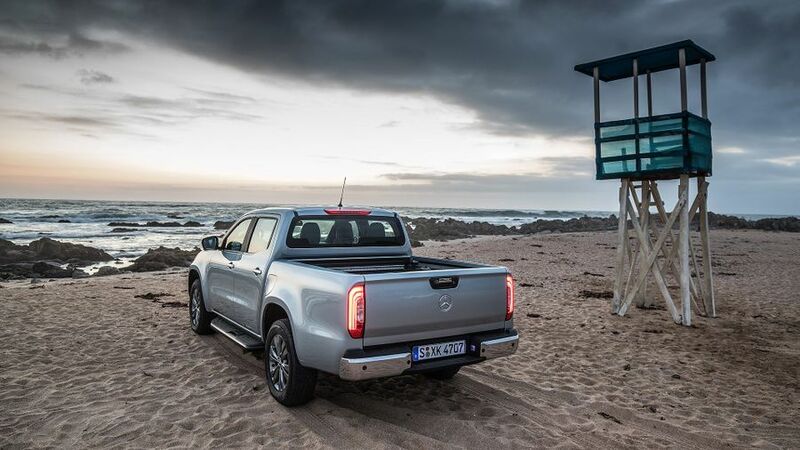 However, if you want your pickup to be more of a lifestyle vehicle that enables you to indulge in outdoor pursuits, ferry the family, and have a comfortable and civilised driving experience, it’s one of the best options in the class. The prestige badge and classy looks also give it a level of desirability few other trucks can match. It’s just a shame the interior quality doesn’t quite echo that. If you’re going to spend the extra on an X-Class, you might as well have the one with all the stuff on it. Cheapest version to buy and run, but we haven’t driven it yet so we don’t know if it’s any good. Until the V6 comes along, this is the range-topper. 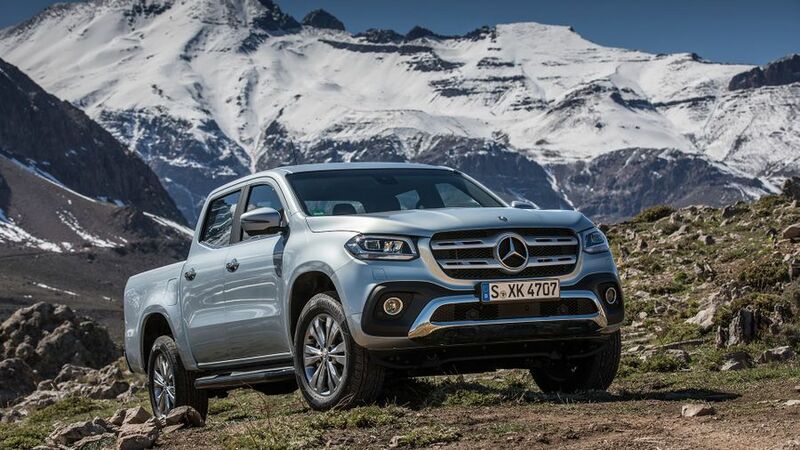 Interested in buying a Mercedes-Benz X Class? Few vehicles are as big and as brash as the good ol’ pickup truck – that’s one of the reasons people love them. Most of the ones you see rolling around are high-spec examples chosen as much for their style as for their versatility. 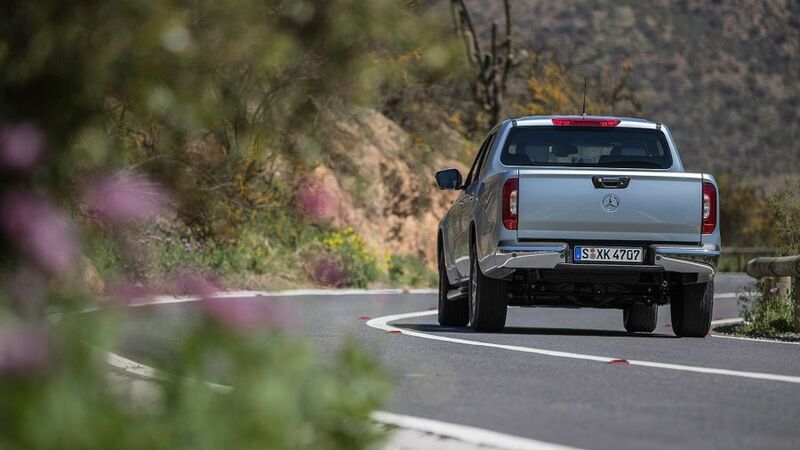 The X-Class very consciously aims at the prestige end of the pickup spectrum. It has many of the same styling features as Merc’s luxury SUVs, with similarly-shaped lights and a big grille-mounted Merc badge. The entry-level Pure model still looks properly basic, with steel wheels, black bumpers and a dark plastic radiator grille. The mid-spec Progressive model has alloys and colour-coded bumpers, along with skid plates front and rear and a silver grille. The range-topping Power model comes with loads more chrome on the bumpers and door handles, plus some posher trim on the grille. Overall, it combines typical pickup ruggedness, with typical Mercedes sophistication and prestige. That’ll make it extremely popular with a lot of buyers. Mercedes positions the X-Class as a posher, more prestigious alternative for pickup buyers, but look inside the cabin, and you might not feel this promise has been delivered on. The steering wheel and instrument cluster are as nice as in any Merc, and the X-shaped air vents look and feel good as well. You also get the same infotainment interface as in most Mercedes passenger cars, which looks sharp and works very well. The materials on the top half of the dashboard also look very lustrous, but look at the bottom half, not to mention in the footwells and lower down on the doors, and the plastics become very hard and scratchy, meaning the cabin doesn’t feel as high in quality as it should. We can think of other pickups that feel posher. You get the high driving position and clear visibility pickup drivers love, but the short seat base might leave you wanting more thigh support, and the steering wheel only adjusts for height, not for reach, which might mean some drivers struggle to get comfy. 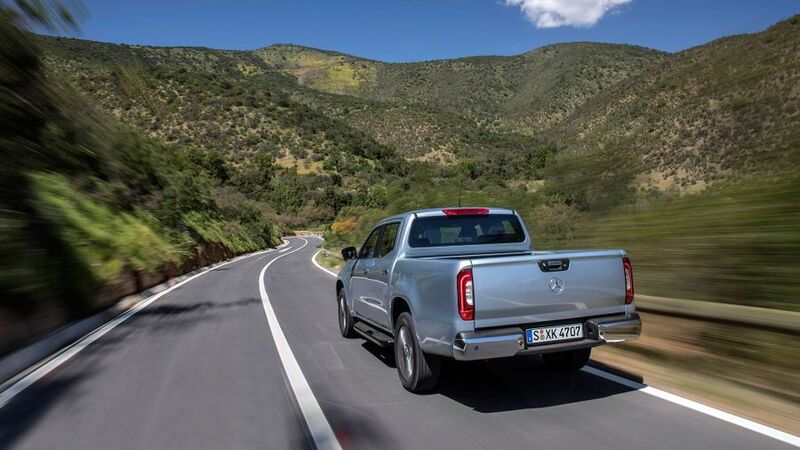 The X-Class is available in double-cab form only, meaning all versions have rear seats. These have enough head- and legroom for a pair of tall adults to get comfortable – more than in a Volkswagen Amarok – and because the floor in the middle is reasonably flat, fitting a third person in isn’t out of the question. 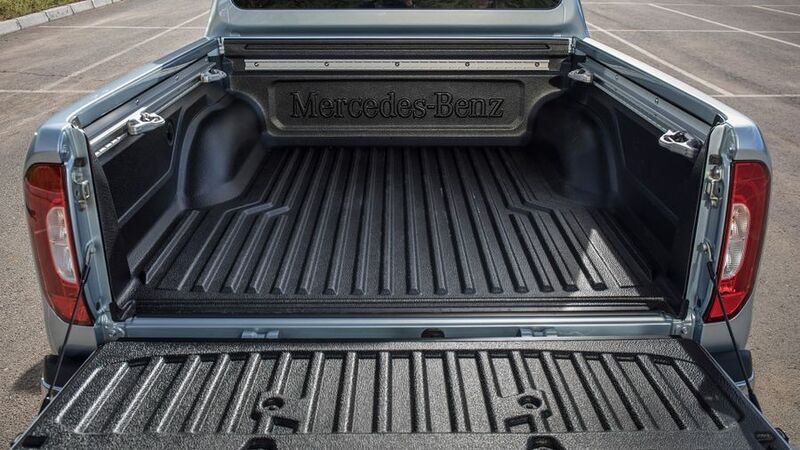 All pickup trucks of this type have roughly the same sized loadbay, and the X-Class is no exception. If you like, it can be covered with a hard-top or a retractable roll-top, and can also be embellished with loading rails or lockable storage boxes. The payload – the weight you can carry – is very standard among this sort of pickup at about a tonne, as is the towing weight of 3.5 tonnes. Mercedes reckons the X-Class won’t just appeal to buyers who already drive pickup trucks, it’ll also tempt buyers out of more conventional prestige SUVs. We think that’s a bit optimistic. It uses the tried-and tested ladder frame chassis all pickups do, meaning there’s inevitably some shudder and tremor to be felt through the body over rough roads that you simply don’t get in more conventional offerings. Compare the X-Class’ ride comfort with other pickups, though, and it feels really impressive, protecting you from most of what a scruffy surface can throw at you. It’s also really good at keeping the outside world outside, with excellent suppression of wind- and road-noise, making it a more relaxed way to travel than pretty much any competitor. It doesn’t feel overly cumbersome in the corners, either, because the suspension keeps body lean in check reasonably well, while the plentiful grip – whether in rear-wheel-drive mode or with four-wheel drive engaged – also helps keep things stable and secure. The steering is pretty exemplary, too. It’s a bit slow, like it is in all pickups, but it has a really solid feel and is nice and progressive in the way it reacts. 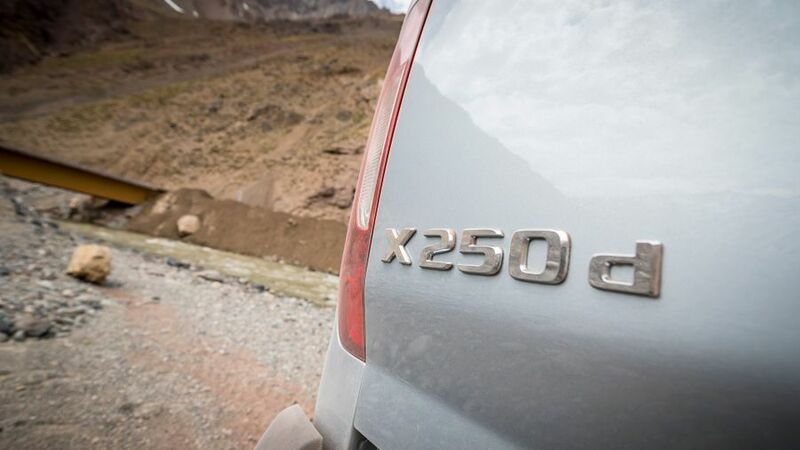 Initially, the X-Class will be offered with a choice of two four-cylinder 2.3-litre diesel engines – badged X220d and X250d – offering 163 horsepower and 190 horsepower, respectively. So far, we’ve only had the chance to sample the more powerful X250. 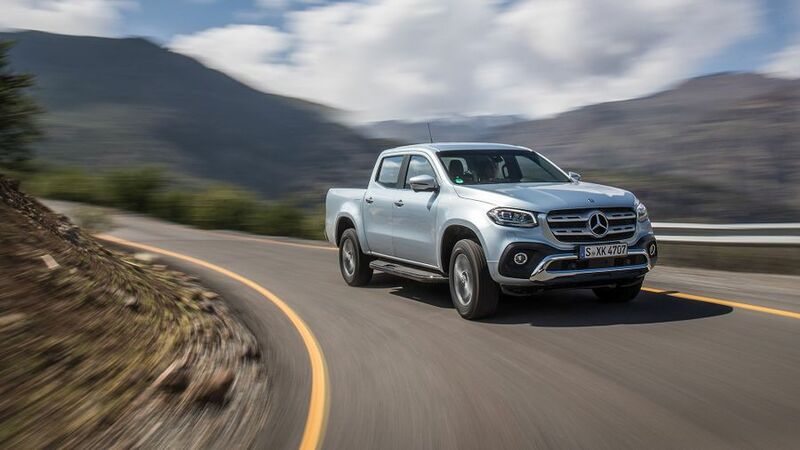 It’s muscular from low revs, meaning you don’t have to floor the accelerator too hard to get the X-Class moving, or to pick up speed gently on the move. Most of the time, it works very smoothly and unobtrusively with the seven-speed automatic gearbox as well. If you demand more speed by burying the accelerator, the gearbox kicks down and works the engine harder, but you don’t get a great deal more acceleration. What you do get is a lot more noise and vibration transferred through to the cabin from the engine bay, so it’s much better to adopt a lazy driving style and just be happy to get there when you get there. A V6 diesel will join the range in a few months, and this is the one the majority of UK buyers will want. We’ve had a passenger ride in a very early prototype version: it goes like the absolute clappers and is way quieter and smoother than its four-cylinder counterparts. The X-Class is aimed at the more exclusive end of the pickup market, and it’s priced as such, making it an expensive option for customers. It costs considerably more than pretty much every other rival except the Volkswagen Amarok, and with the VW, you get a brawny V6 diesel engine for your money rather than the four-cylinder you get with the Merc. You can comfortably predict the X’s desirability will mean resale values will stay strong, but it’s too early to say exactly how solid they’ll be. As well as paying more to buy the X-Class, you’ll also pay more to run it. With fuel consumption in the mid-thirties on both engines, it’s thirstier than the equivalent Nissan Navara and about the same as the more powerful Amarok. That said, the correspondingly high CO2 emissions won’t be too much of a problem for benefit-in-kind payers, because you pay a comparatively affordable flat rate on pickups. Mercedes’ relatively lowly position in the manufacturer standings of Warranty Direct’s Reliability Index can be tempered slightly by the fact the X-Class is mechanically very similar to a Nissan Navara, and Nissan sits much higher in the rankings. You can also take some heart from the vehicle’s rugged construction, and the fact it’s built to withstand the rigours of your average building site. However, the Warranty Direct study also considers the Navara as an individual model, and things look a lot less rosy, because older versions have a very low score. That’s not all that encouraging for prospective X-Class owners. Still, the three-year/unlimited mileage warranty will provide more peace of mind. As many pickups are designed to be very utilitarian and basic, this isn’t an area in which they usually dazzle. The X-Class, however, really stands out from the crowd on safety. As standard across the range, it comes with seven airbags – including one to protect the driver’s knees – along with some of the latest kit to prevent an accident from happening in the first place. That includes automatic emergency braking, a lane-keeping assistant, and a traffic sign recognition system that reminds you of the speed limit. The X-Class hasn’t yet been crash tested by Euro NCAP, but with this above-average level of safety equipment, we’d expect it to rate pretty highly if/when it is. 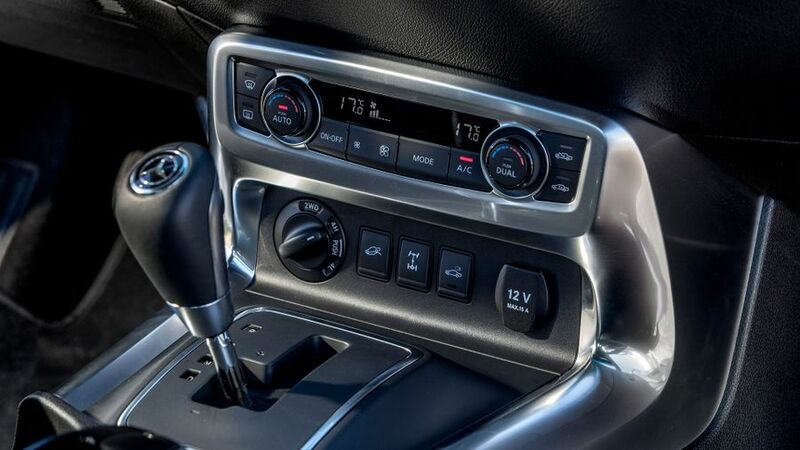 The base-level Pure model comes with the essentials such as air-conditioning and the high-definition infotainment system that incorporates Bluetooth connectivity, DAB radio and a bunch of connected services. Across the range, this system can be upgraded to support sat-nav for a small fee, and the whole system can be replaced for a swankier one for a bigger fee. Progressive trim adds some aesthetic embellishments and automatic windscreen wipers, but very little else. Power trim adds keyless go, electrically adjusting front seats, and leather-style upholstery on the seats and the top of the dashboard. A bunch of optional extras are available, too, including 360-degree cameras that are very handy for both parking and off-roading. Because you want the style and functionality of a pickup truck, but you want your vehicle to have a more prestige image than your average truck, and a more luxurious interior. It certainly delivers on the first point, but not so much on the latter. It does, however, deliver a very sophisticated driving experience, decent interior space and lots of safety equipment. Overall, it’s still a very tempting proposition, if a rather expensive one.